NOTE: ONE MILE GALLERY, based upstate, in Kingston NY . . .
is presenting some ‘GEE’S BEND’ quilts . . at the Outsider Art Fair in NYC, this weekend / JAN 19 – JAN 22, 2017.
they will be featuring quilts by Gee’s Bend quilters: MARY L. BENNETT, MARY McCARTHY, LUCY MINGO, LOLA PETTWAY, NANCY PETTWAY, RITA MAY PETTWAY & ANN MAE YOUNG . .
at the ‘God’s Love We Deliver’ booth, booth #60. NOTE: a photo of RITA MAE PETTWAY, standing in front of her grandmother’s quilt, is included below, in my archival artnet pix from – the Whitney’s . . ‘Quilts of Gee’s Bend’ opening, Nov 21, 2002.
and, so you can see the community, and the free-form ‘dialog’ of these quilts – has very deep roots. which opened Nov 21, 2002 – at the Whitney Museum – in that . . ‘ART LOVERS NEW YORK – FEB 2003’ flashback artnet report. there’s recently been some buzz circulating that there will be a ‘GEE’S BEND QUILT’ show, this summer 2017 at the MET, but when I called the MET / Metropolitan Museum of Art . . press office to inquire, I was told . . that the show was postponed until next summer 2018 ??? 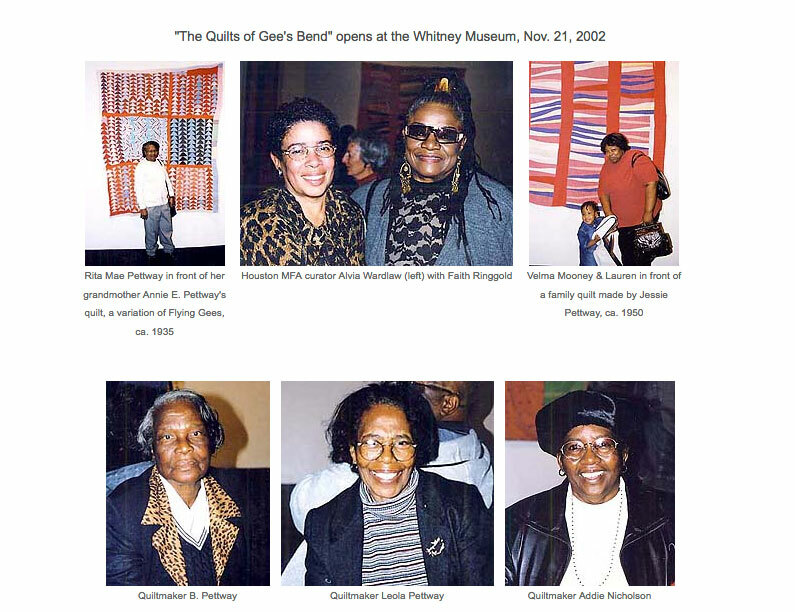 ‘GEE’S BEND QUILTS’ opening photos – Whitney, Nov 21, 2002 / published in artnet Feb 2003. & the very first ‘Gee’s Bend Quilt’ coverage – to receive mainstream, NYC art press. all photos by me / NANCY SMITH. note: Houston MFA curator ALVIA WARDLAW, with FAITH RINGGOLD – at center. & note: the quilt in the top row, extreme right – went on to become a cornerstone ‘Gee’s Bend’ image – going forward. I was pretty much the ONLY media photographer, let alone art world photographer . . present at the opening. the woman of ‘Gee’s Bend’ were not famous yet, but I definite helped get the ball rolling – for them !! part of what made the impact, and sizzle, was how their opening night pix were included among the cutting edge contemporary art, including RACHEL WHITEREAD, going on in the city at the time, which is damn well – straight up !! thanks again, to . . WALTER ROBINSON, my artnet editor at the time – for having the foresight to do that. if, you follow artlovers you know I repair old quilts, collect, and study them – so going to the opening was a no-brainer for me. the woman were . . amazing. my biggest struggle was understanding their ‘dialect’, especially with me coming out of Montreal, Canada. but I got the majesty, and relevance of the quilts – right away. you are . . a quilter !! it was a night, like a star-filled sky.